SYDNEY/TOKYO (Reuters) - Financial giant Japan Post Holdings Co Ltd launched its global expansion strategy with its largest ever deal on Wednesday, agreeing a A$6.5 billion ($5.1 billion) takeover of Australian freight and logistics firm Toll Holdings Ltd. 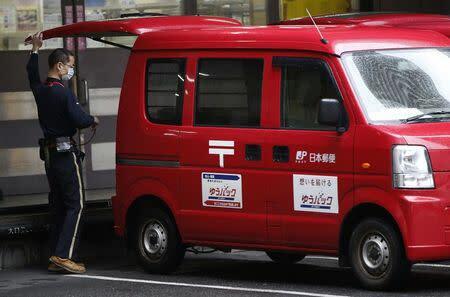 The proposed cash acquisition would give Japan Post a reach spanning 55 countries and a surge in earnings power ahead of a planned listing later this year, as it aims to become a leading international logistics player as well as one of the world's biggest financial institutions. The deal will help answer critics who say state-owned Japan Post lacks a global growth story to attract investors and offset the decline in its domestic postal service business. "We have made a first step toward becoming a global logistics company ... 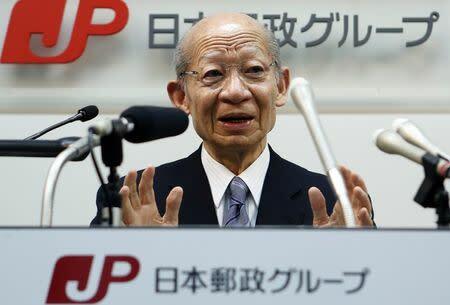 The days are over when logistics companies can survive by shutting themselves within Japan," Japan Post Holdings President Taizo Nishimuro told reporters in Tokyo. Combined, the two would be the world's fifth-largest logistics group after FedEx Corp in terms of revenue, Japan Post said. Japan Post has total assets of some 295 trillion yen ($2.47 trillion) including its mail, banking and insurance service. The banking arm alone ranks 17th in the world, even though its overseas business is currently limited to joint operations in several Asian countries. By snapping up Toll, the Japanese giant will gain a wealth of experience in offshore deals as it tasks the Australian firm with leading acquisitions throughout Asia, Europe and North America. In what would be Australia's fifth-biggest inbound acquisition and the largest takeover of an Australian company by a Japanese firm, Japan Post offered A$9.04 per Toll share - a 49 percent premium to Toll's last closing price. Toll's directors described the valuation as "compelling" and unanimously recommended it. Toll shares leapt 47 percent after the deal's announcement to A$8.95 on Wednesday, helping push the broader Australian market 1 percent higher. The deal also helped buoy the Australian dollar, which rose more than 1 percent against the yen overnight. "Together this will be a very powerful combination and one of the world's top five logistics companies," Toll Chairman Ray Horsburgh said in a statement. Under the deal, Toll will keep its name and current management. Takahashi said there would be no major job cuts at the Australian target. Toll's ex-chief executive officer, Paul Little, who led the company's expansion into Asia and quit after 26 years in 2012, could be one of the biggest winners from the deal. He stands to make a A$325 million windfall from his 5 percent stake. The proposed deal was revealed as 127-year-old Toll posted a 22 percent fall in half-year net profit. The Melbourne-based firm has been restructuring and putting assets up for sale after its Asian expansion exposed it to falling commodity prices and freight volumes. In 2014, the company began an about-face, saying it wanted to sell A$100 million of assets. "Toll has had a less-than-stellar six or seven years, so Japan Post would be looking at how they can utilize Toll's assets to get better outcomes ... plus they might like the fact that it takes them into new geographies that they have a positive view on," said Angus Gluskie, a portfolio manager at White Funds Management. David Fraser, an analyst at Sydney-based Shaw Stockbroking, said Toll remained a "great company" despite its growing pains in Asia. The company's Asian growth prospects rely heavily on commodities logistics, which are under pressure, he added. The sale must be cleared by Australia's Foreign Investment Review Board, which has at times blocked acquisitions by foreign state-owned bidders. Toll Chairman Horsburgh said he expected the takeover to be approved.